You need the confidence or a catalyst to crush an upcoming project. Born in 1927, Dr David J. Schwartz dedicated his life to teaching leadership development and life strategy. And it shows. Like other giants in the genre, The Magic of Thinking Big is saturated with a lifetime of hard-won lessons, perfect parables and grandfatherly wisdom. If you like what you read here today, check out the “Still Curious?” section at the end of the post for more summary suggestions you’re sure to enjoy. How to capitalise on the power of now. Good luck, good reading and go well! 1. HOW TO DEFEAT DISBELIEF AND THE NEGATIVE POWER IT CREATES. Don’t talk or worry about it. Be grateful it’s as good as it is. Never underestimate your own intelligence. Don’t confuse your ability to learn with your ability to think. Look at your age positively and capitalise on its unique advantages. Remember, a 50-year-old is barely 50% into their productive adult life. Do what you want to do, your best years are still ahead of you. Don’t be a wishful thinker – count only on your own persistence. Accept the law of cause and effect – the harder you work, the more luck you’ll have. Fear: Embarrassment at personal appearance. Fear: Losing an important customer. Action: Double down on better service. Action: Convert worry time to study time. Fear: Things beyond your control. Focus on relieving other people’s fear. Fear: What others may think and say. Action: Be sure your plan is right. Then do it. Action: Analyse all the factors then be decisive. Family responsibility – you owe it to your family to be the best person you can be; use them as inspiration, not as an excuse. Don’t Let Little People Drive You Down. Remember that snipers are psychologically sick – Be big. Feel sorry for them. 2. HOW TO MAKE YOUR MIND PRODUCE POSITIVE THOUGHTS. Be good news – spread only good news about your experiences and feelings and you will become (and feel like) good news. Give others planned attention – put others first and be thoughtful about being thoughtful. N.B., for one of the best books ever written on this topic, see this summary of How to Win Friends and Influence People. Always give others more than they expect to get. Think “I’m equal to the best”, not “I’m outclassed”. Believe in the process: success comes from well-managed thinking. Anyone who is now good at something was once bad at it. 3. HOW TO SET YOURSELF UP FOR SUCCESS. Being likeable starts with thinking right toward other people. Say nice things to strangers. Never miss a chance to congratulate or empathise. Be interesting and give value to others – but guard against being a know-it-all. Smooth the “scratchy” parts of your personality – be a pleasure to be around. Don’t blame others when you have a setback. Do all these things and never try to buy friendship; it’s not for sale. Dress Right. You Cannot Afford Not To. Take care to dress like the person you want to become. You’ll get better advice in store. Manage Your Environment to Recondition Yourself for Success. Manage your energy: Don’t gossip, condemn or take part in negative conversations. 4. HOW TO DO MORE AND DO IT BETTER BY TURNING ON YOUR CREATIVE POWER. Learn and become interested in things around and beyond “your job”. How can I be a better friend, partner or parent? What special favour can I do for my customers? Remember, “capacity is a state of mind”. One inspiring group outside your normal occupational/social area. Concentrate on and really listen to what others say. Put your ideas into action as soon as they ripen. Take time out to confer with yourself and tap your supreme thinking power – make quiet, focussed time every day to just sit in solitude and think: confer with yourself. 5. HOW TO PLAN A CONCRETE SUCCESS BUILDING PROGRAMME. Write your ten-year plan – ask: What do I want to accomplish? Who do I want to be? What will satisfy me? and How will I get there? Pick one major goal at a time and let it absorb you – allow your subconscious to go to work for you (see this summary of Think and Grow Rich for more). Invest in yourself – invest in things that build mental power and efficiency and invest especially in education and idea starters. 6. HOW TO CAPITALISE ON THE POWER OF NOW. Be a doer, not a don’t-er – take action every day to move forwards! Why are you still reading? Get in gear and go! 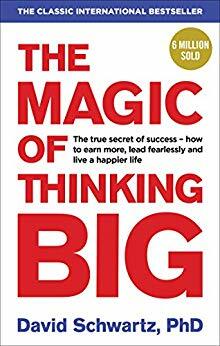 The Magic of Thinking Big is a powerful reminder that we are capable of exactly as much as we think we are. And while it’s clearly untrue that nothing is impossible, what I love most about Schwarz is his message that the limits of who we might be and what we might do lie far, far beyond the dip of our current horizons. So defeat disbelief, cultivate positivity, set yourself up for success, decide who you want to be, clarify what you want and get to work making it real. Be BIG, believe BIG, take BIG action. And above all, don’t wait – do it NOW. Because the only person responsible for your thinking is you. I enjoyed reading this summary. I found it inspiring and relevant. Thanks for what you are doing! Hi, Jackie – I’m so pleased you enjoyed it. Thank you for stopping by!